Ed Stafford, 38, was born in Peterborough and educated at Stoneygate School, Leicester; Uppingham in Rutland; and at Newcastle University. He then earned a position in the prestigious commissioning course at the Royal Military Academy Sandhurst, and was commissioned as a British Army Officer in July 1999. Ed went on to command platoons in the Devonshire and Dorset Regiment, gaining his Northern Ireland medal in 2000 for his tour of Crossmaglen, South Armagh. Ed’s happiest military years were spent as an instructor at RTC Lichfield where he oversaw several hundred recruits through their basic training, before leaving the military as a captain in 2002. Ed saw an opportunity to widen his experience when the United States invaded Afghanistan after 9/11. Ed took a position as a UN contractor advising UN electoral workers on planning, logistics and security matters during the first ever presidential elections. Ed managed a team of similar contractors from Herat, in the western region of Afghanistan. During his time there, Ed’s election counting centre was rocketed by terrorists; his airport camp was mortared by improvised explosive devices that narrowly missed his un-armoured office; and the compound he was stationed in was burned to the ground when the warlord Ishmael Kahn was removed from office. Returning to expeditions, Ed took on a new challenge – setting up extreme cold weather expeditions in Patagonia, Argentina, for the expedition company GVI. Ed was Director of Programmes in Argentina, carrying out scientific research projects and Northern Ice Cap traverses in Chile. Ed Stafford: Into the Unknown – in which he seeks the truth behind mysterious satellite images of Earth’s most remote locations. One such site can be found in the desolate, rugged wilderness of Russia’s Siberia region. Here, among the silent forests and eternal cold lies a mysterious crater that has long defied efforts to categorize or label it; a place that was stumbled upon by accident and is the very definition of strange natural wonder. whatever location we want on a whim, there is the conception that there are no new places to be found that lie beyond our all-seeing eye. However, this was not always the case. There was a time where exploration could uncover new natural wonders right over the next hill, and places remained out in the wild frontiers of the world that managed to elude not only detection, but explanation as well. In some cases, the answers to these mysteries have come no closer to being solved even as we have advanced to the age of satellite mapping. One such site can be found in the desolate, rugged wilderness of Russia’s Siberia region. Here, among the silent forests and eternal cold lies a mysterious crater that has long defied efforts to categorize or label it; a place that was stumbled upon by accident and is the very definition of strange natural wonder. The bizarre tale starts with an expedition in 1949 into the furthest reaches of Siberia by the geologist, Vadim Kolpakov, who embarked on a mission to draw up a geological map of the region. When he reached the northernmost part of the remote Irkutsk region, Kolpakov was confronted with tales of an “evil” place sequestered away within the woods that the native Yakut people referred to as the “Fire Eagle Nest,” which they warned was so saturated with an evil force that deer and a lot of other wildlife refused to go near it. It was also claimed that anyone who went near this place experienced severe symptoms of nausea, and that some who had ventured there had simply never returned. The cone was 80 meters tall, 150 meters wide, and had an inner circle dome about 12 meters high. The geologist at first thought that it must be the cone of a volcano, but on closer inspection realized that this was not the case. Besides, there were no known instances of volcanoes in the area for millions of years and the dome sitting in the center was extremely unusual for any sort of volcano. Due to the fact that trees did not grow up on the crater’s slopes, and that wind had not yet settled the soil, Kolpakov estimated the crater’s age as being around 250 years old, an idea that would later be backed up by tests with more modern equipment. The discovery of the strange crater would go on to spark a quest for answers that has baffled experts for decades. The enormous, bizarre crater was named Patomskiy, after a nearby river, and as soon as it was found, theories as to its origins began to pour in. One of the earliest ideas was that it was merely a slag heap, but it was soon realized that there were not nearly enough people living in the area to create such an immense structure. It was also suggested that it could have been the site of one of Russia’s many notorious gulag labor camps, but this idea was soon abandoned as well. Kolpakov himself speculated that the crater was formed by a meteorite strike, a theory that gained some prominence in later years, but soil samples from the site have failed to produce any evidence of meteorite material, and the unique shape of the crater is not consistent with any other known meteorite crater. The odd shape of the crater is not really consistent with anything we know of, in fact, only adding fuel to the mystery. Others have stuck to the idea that it is volcanic in origin, but again there is no evidence to such an effect, and the area is not known to exhibit any volcanic activity. The idea that it could have been caused by an underground gas explosion also does not carry much weight, as there is no evidence to support it. Some scientists, most notably the geologist Alexander Portnov, have come to the conclusion that the Patomskiy crater is the result of a piece of rock that perhaps sheared off of the meteor behind the Tunguska explosion, which leveled a large area of forest in the Krasnoyarsk region in 1908. It is surmised that since the Patomiskiy crater lies just west of the infamous Tunguska event, and since its age is estimated to be roughly around the same time, in 1908, and in fact there are some who think this is the actual crater of the Tunguska meteorite, which had previously been believed to have exploded in the atmosphere. Perhaps inevitably, more far out ideas have cropped up over the years as well. There has been speculation that the crater was the result of a UFO crash or even a nuclear explosion, but there is nothing to strongly suggest that either of these carry any weight. 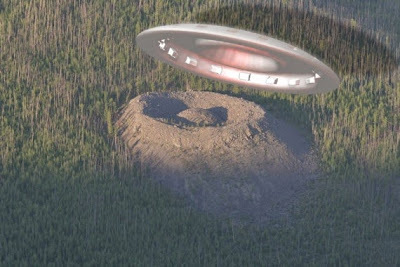 The only shred of light that has been shed on the mysterious crater is the discovery of what is believed to be an incredibly dense object with high iron content lying an estimated 100 to 150 meters below the site, although what this object might be remains a mystery. The object was first discovered in 2006 by an expedition led by doctor of geological-mineralogical sciences Alexander Dmitriev, from Irkutsk State Technical University, and seems to produce magnetic anomalies. On Earth this material is not available, but somewhere in space it may exist. Counting the fact that two meteorites cannot fly one after the other, hitting the same spot I cannot imagine the nature of this strange object. I do not know what it is. Only adding to the air of enigma enveloping the crater is the fact that analysis of the growth rings of the trees of the vicinity seem to show that they have experienced a period of unusually accelerated growth over four decades after which it reduced to a more normal level, a phenomenon only ever witnessed before in trees of the Chernobyl area after the disaster there. It is unknown what could have caused this odd growth spurt. There is also the presence of a low level of background radiation that is higher than that of the surrounding area and is believed to have once been much higher. No one has been able to figure out just exactly where this radiation could be coming from or why it should be occurring at this one location. There is also a complete lack of any vegetation growth within the crater, despite so much time elapsing since its creation. There is also the crater’s rather odd habit of shifting constantly, rising and falling according to the whims of some as yet misunderstood force. The mystery of the Patomskiy crater deepened in August of 2005, when an expedition to the crater was launched by an experienced geologist by the name of Eugeny Vorobiev. The expedition started out from the town of Badaybo, and took the only road into the wilderness for 200 km, after which it was necessary to trek overland through perilous wilderness to reach the crater. When the expedition was only a few kilometers from the Patomskiy crater, tragedy struck when Vorobiev suddenly collapsed to the ground for no apparent reason. Colleagues rushed to save the scientist, but he died on the spot. When the body was brought to a hospital in Irkutsk, doctors said that Vorobiev had died of a sudden, massive heart attack, but the death remained somewhat mysterious and local people insisted that it was linked to the evil pervading the region. What is the Patomskiy crater? Is it some sort of volcano? The result of an underground explosion? Was it created by a meteor strike or a crash landing spacecraft? What lies buried beneath it; a rock or a UFO powered by some sort of nuclear reactor? More than 60 years after its discovery, we still don’t really know for sure. Perhaps in the future further expeditions will come to a better understanding of this strange enigma, but for now it lies out there in the cold Siberian wilderness, a mystery that eludes us and perhaps even pulses within the earth with some inscrutable intent of its own.